This recipe was developed at the request of my sister-in-law. She was having a major wasabi craving — in her words “I’m like SO craving wasabi that I’m sitting here eating a bowl of heated up frozen broccoli from a box, with soy sauce and wasabi on it” — and wanted crusty tofu with a wasabi coating. It tooks a few tries to figure out how to get the tofu crusty (I cheated and used Chex crumbs), and then a couple more tries to get wasabi flavor right, but hopefully this is a passable solution. Press the tofu for half an hour. Meanwhile, combine the tamari, mirin, honey, and ginger in a small saucepan. Heat over high heat until just beginning to boil, then reduce heat to medium-low and simmer for 15 minutes. Remove from heat and use a whisk to mix in the wasabi until completely combined. Slice the tofu width-wise into eight even pieces. 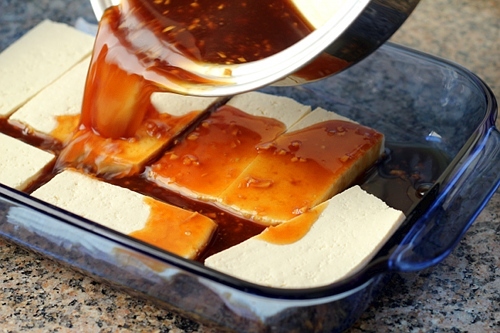 Place the tofu in a casserole dish (or plastic bag) and cover with the sauce. Marinate 1-2 hours, flipping the tofu halfway through. Preheat the oven to 375 degrees Fahrenheit. Line a baking sheet with parchment paper or lightly grease with oil. Place the Chex crumbs in a shallow bowl. 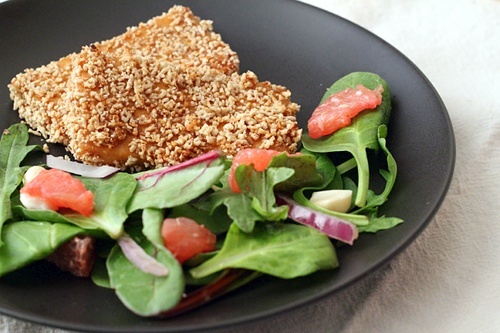 Coat the marinated tofu in the crumbs, then place on the baking sheet. Bake for 30 minutes, flipping halfway through. Remove and serve. Mirin is a sweetened rice wine. If you can’t find it, use sake or sherry and add a little extra honey. The wasabi gets muted once the tofu is baked. I used 2 tablespoons, and while the marinade had a definitive kick before baking, the final product was pretty mild. If you don’t like spicy foods or don’t like the taste of wasabi, you can leave it out entirely. The longer the tofu marinates, the stronger the flavor. If you have the time, I’d encourage a longer than 2 hour marinating time. I was running out of daylight, so I had to cut things short. I’m sharing this recipe in Slightly Indulgent Tuesday, Allergy Free Wednesdays, Full Plate Thursday, and Food Friday. This looks fabulous! I’m eager to try it. Maybe the next time Kathy visits? This looks wonderful. My son loves tofu, and we are trying to eat a lot less meat, so this is a perfect recipe for me to try. Thank you for sharing it! Wow, a kid who loves tofu. I figured that wasn’t that common. I hope he enjoys it. Yum, pinned it to try! This sounds delicious. We never buy any cereal though. WHat would you recommend as a substitute for Rice Chex? I’d love to give these a try. Is panko not an option? 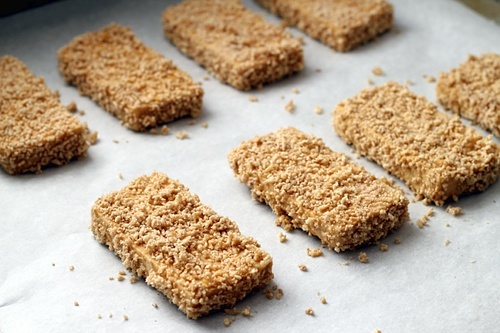 Or there’s always the option to make your own dried bread crumbs. 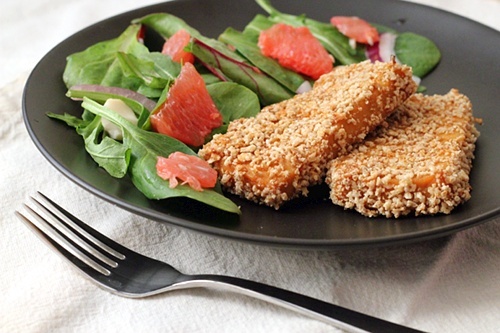 What a great way to eat tofu! I think I always need new ways to eat tofu. Your Crusty Wasabi Tofu looks so pretty. Your photo is awesome and this is a great recipe! Hope you are having a great week and thank you so much for sharing with Full Plate Thursday. We should talk crispy tofu. I have ways. Ooh, well, I suppose we will have to meet up. 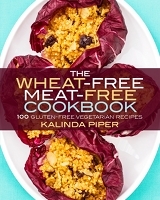 fyi, I will be featuring this recipe this week on AFW! I tried to make this last week, but the marinated tofu was so delicious (even though I forgot the wasabi!) that I ended up eating it all, slice by slice, straight out of the fridge. I actually think I’m going to start making that as a separate dish, maybe garnished with scallions. So I’m going in for round two tonight–I did 2 tablespoons of wasabi and the marinade is so spicy that I don’t think I could eat it this time without mellowing it down by baking. I’m going to marinate it overnight and then bake it tomorrow. Ha, that’s pretty funny. I could definitely see the cold marinated tofu being a refreshing summer dish. This recipe passed the first test- my mouth watered as I read it! I’m such a dork. I made this recipe and really liked it -my only thought was to change from corn chex to rice chex…. I just reread the recipe. HA!! (Corn chex is what I had in the cupboard.) Now I can tell you that YOUR recipe is perfect! Thanks. It’s funny how your mind kind lives in it’s own little world sometimes. And thank you for stopping by to let me know you liked it.